Prism is one of the Marauders, mercenary mutant who hunt and kill their fellow mutants. He was first seen in 1986, along with most of the bunch. This profile reflects (no pun intended) his late 1980s/early 1990s appearances, since it simply was written that long ago. Howbeit, the main body of Prism appearances back then was… seven panels long. That’s not much, but his powers are interesting to model in RPG terms. Height: 5’11″ Weight: 270 lbs. 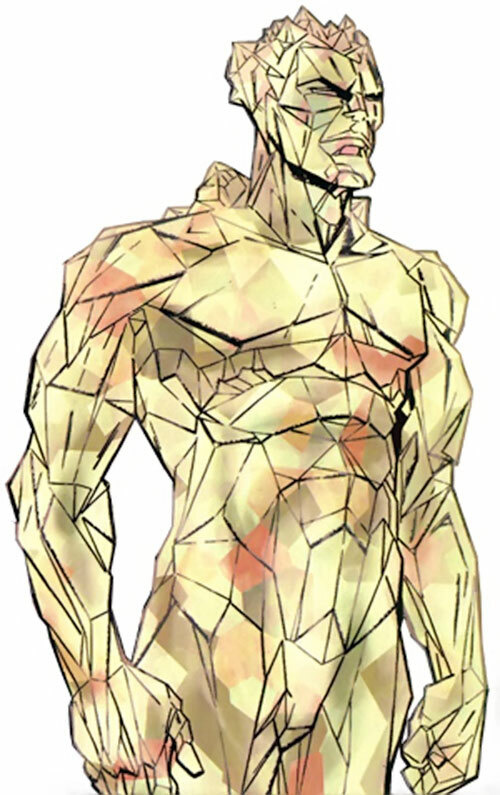 The mutant called Prism had a physiology that turned his entire body into a living crystalline humanoid. The creation of a strong blinding flash by bending natural light from around him onto the opponent. Absorption of any energy-based attack with no harm to himself. Storing and changing of the same energies before sending them back in an amplified energy blast onto an opponent. Unfortunately for him, his crystalline being had a very lethal drawback. He was brittle and vulnerable to any kinetic attack directed against him. Aside from handling his powers Prism appeared to know little else. In 1986, Prism was first documented as a one of Mr. Sinister’s Marauders. As a Marauder he was part of the Morlock Massacre. He met his death in the Morlock Alleys when Marvel Girl, in order to save Cyclops and the Beast from his vicious attacks, slammed him into a steel pylon. This physically shattered him. He hasn’t been seen since as of this writing, not even as a clone. Perhaps it wasn’t worth the effort since he’s only usable against energy-wielders. Sinister probably keeps him in reserve for when the Marauders specifically have to battle energy wielders. Prism was literally a man made of glass. He wore no visible clothing and his entire body is crystalline being semi-transparent whitish in color. He was quite thin and moved in a strange, cartoon-like way. I’ll bet that he would have looked quite cool in a movie ! Like all the other members of the Marauders, Prism was a merciless killer. He was supremely overconfident in his power and ability and failed to see his extreme susceptibility to physical attacks for the danger that it was. In combat he tended to run around until he found an opponent that used energy attacks ; energy attacks that he would use to kill that opponent with himself. Prism didn’t speak much unless faced with opponents in which case he started gloating like no-one else. Since mutants aren’t big in the DC Universe the Marauders are somewhat out of place there. However, the team could be taken as they are in their entirety, hired by some powerful mogul like Lex Luthor, and pitted against any foe, including the JLA. Reflection/Deflection RAPs may exceed the incoming APs of attack (+1). Reflected or Deflected attacks may be delayed for up to 5 phases (+1). Attacks returned by use of Reflection/Deflection can have their frequencies changed into a wavelength that damages energy wielders that usually are immune to their own powers (+1). Flash power can derive enhanced AV/EV from Deflection and Energy Absorption RAPs (+1). Energy Absorption RAPs are cumulative, until spent, up to his total APs of power (+1). Reflection/Deflection only works vs. energy attacks (-1). Life Support (No need to Eat or Drink), Expertise (Prisms). Marauders (Low), Mr. Sinister (Low). Partial Attack Vulnerabilty (-1 CS RV against Physical attacks), Overconfident, Strange Appearance (Humanoid made of glass). Due to his physiological crystalline makeup, Prism possesses the power to absorb the energy of incoming attacks, but only any type of energy attacks (-1), and return it back against his opponents. This return attack is either an altered blast of energy that damages foes who’re usually immune to their own energy powers (+1), or releasing it all as a blinding flash attack against the entire opponent team (+1). Prism can cumulatively save up energy for later use (+1), although the exact duration limits of such savings is unknown. If his storage capacity is full, all excess energy will probably be released as a Flash. Furthermore, by changing the frequency of an incoming attack and by adding in ambient light energy, he can produce an energy attack with RAPs higher than the original APs of incoming attack (+1). When attacked by an energy attack, Prism basically has two choices; absorb the energy for later use or immediately reflect the energy back at the opponents. Since he can cumulatively save up energy from all incoming energy attacks (+1), the first choice is a useful, tactical longer-term choice, most useful when attacked with low-powered energy attacks. The second choice is useful when he faces powerful energy wielders whose power he wants to use to destroy the opponents at once with or when his energy reserves are already high. 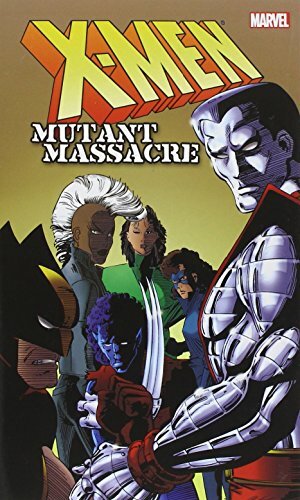 Source of Character: Various mutant books, Marvel Comics. Helper(s): Sébastien Andrivet, John Colagioia.